Thanks! With so much work being put into OpenMW by others, I find it hard not to contribute as well. Here are the new icons for menus along with source .blend file used to render them. They are named with a prefix "menu-". In case a different naming convention is desired let me know. 1. File->Open Load Error Log. 3. Scene (not sure how it used). I added missing icons based on existing ones to my PR. Feel free to replace them lately if you do not like them. Menu icons are in master now. And they are looking great! And although reusing record button bar icons and changing the rotation of next-previous arrows for Move Down and Move Up is not terribly difficult, I still need icons for Touch Record and Edit Record, since it doesn't look like there are any that can be reused for them. 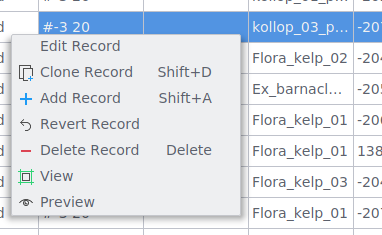 Maybe use Object icon for Edit Record, but that's not very recognizable. 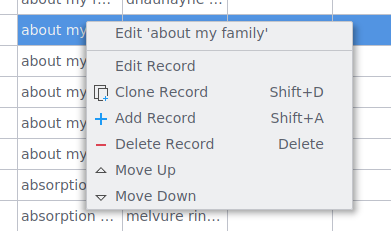 Edit Record purpose is obvious (it opens the record subview with various parameters you can change). Looks like Touch Record makes Land records specifically pseudo-modified so they can use land textures from the current content file. Thanks to akortunov we've got our two new icons. Yay. See the PR page for more images I'll add there in a moment.